cataLION is almost here! 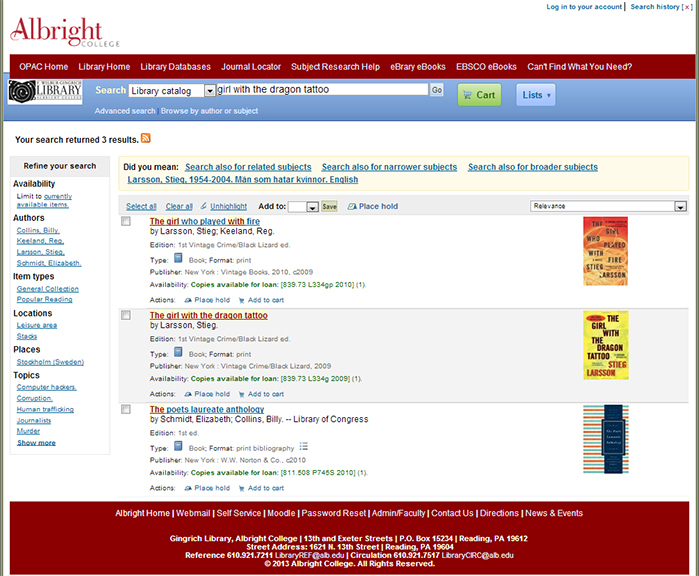 New Integrated Library System Coming Soon to the Albright College Library | What's Happening at the Gingrich Library? ← Tails a Waggin’ at the Library! For the past two years Library staff have been busy behind the scenes working to bring a new Integrated Library System (ILS), called cataLION, to the Albright College Library. Powered by the open source software Koha, the system provides the backbone for the library’s online catalog, as well as the behind-the-scenes cataloging, circulation and acquisitions functions. created by librariansCreated by librarians, Koha is an open source product used by thousands of libraries around the world. We’re looking forward to the increased functionality and efficiencies this new product will provide. We’ll be rolling out these changes in the coming weeks and we will also be providing lots of information and tutorials to help users navigate the new system! This entry was posted in cataLION, New! and tagged graphical user interface, integrated library system, open source product, software. Bookmark the permalink.